Miguel Cotto was just waltzing away to survive. His face was all puffed up. The mean face before the game was no more. It would have been wise to stop the fight before the twelfth round, but he kept going. He was warrior after all. Thank goodness referee Kenny Bayless decided for him to end it at 55 seconds in the last round. Manny Pacquiao has won his seventh title in seven divisions! What a feat! He kept his composure and methodically put the hurt on his opponent. Cotto did not see what was coming literally. His disfigured face was evidence of the flurry of punches Pacquiao inflicted on him. It looked like Pacquiao will have a long night when Cotto started strong in the first few rounds. It was ironic that Cotto went into offense first since Pacquiao was supposed to put him out early. It was also surprising Pacquiao looked fresh in all rounds. The man is a beast! Pacquiao dropped Cotto with a right hand in the third round and a big left hand in the fourth round. Cotto was out of answers from that point on. From that time until Bayless called the fight, Cotto was in survival mode. Pacquiao was frustrated when Cotto was just waltzing away to survive and would not engage full force. But alas, Pacquiao TKOs Cotto in the twelfth round. In the press conference, humble Manny said he was just a regular fighter fighting good fighters. Master Freddie Roach disagreed. Manny apologized like a little mutt to his master. It was a hilarious exchange between the two. 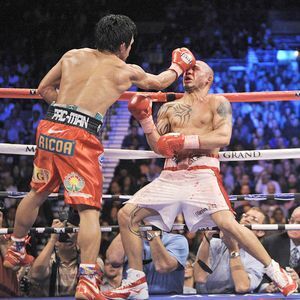 Pacquiao also admitted that Cotto’s punches hurt, but he had to take a few just to test Cotto’s power. So who’s next? The crowd chanted Floyd Mayweather. That would be next logical step. It’s too bad Floyd wants more money even when he’s not the undisputed number one fighter anymore. Will Manny Pacquiao Win His Seventh Title Against Miguel Cotto? Manny Pacquiao will be fighting Miguel Cotto on Saturday, November 14, 2009, for a shot at Cotto’s WBO Welterweight belt. But more importantly, a win for Pacquiao means he will be the first person to win seven world titles in seven different weight divisions. Cotto is perhaps Pacquiao’s most formidable opponent yet. While Pacquiao had to pack some pounds to qualify as a welterweight, Cotto is a natural in this weight class. It’s rather interesting that the catchweight is 145 pounds. Cotto needs to lose a couple to get down to 145 pounds or faces a penalty fee of one million dollars per pound over the catchweight. Pacquiao, meanwhile, can load up on rice! The “experts” has been mixed with their predictions again. It was the same case with the Ricky Hatton fight. But we knew what happened. “Manny Pacquiao’s nickname is ‘The Mexicutioner.’ He’s beaten more Latinos than the police. Pacquiao…unanimous decision.” - George Lopez, Comedian, Actor, and Host of Lopez Tonight! The anticipation begins. Would it be a clinic by Pacquiao? Cotto thinks otherwise. Will they slug it out like a rumble in the Bronx? It would be action-packed for sure! Pacquiao’s speed versus Cotto’s size and power. Can’t wait!